With a succession of editorial bookings for Vogue Italia, American Vogue, Paris Vogue, Love, and i-D, Imaan Hammam is the new kid on the block at the top of every credible casting director's hit list. The mixed Moroccan Egyptian beauty galvanised industry attention when she was selected by designer Riccardo Tisci to open Givenchy's Spring/Summer 2014 show. With her rich caramel skin tone, almond shaped brown eyes, tempestuous pout, and spectacular 179 cm frame, Hammam possesses the complete package that appeals to beauty clients, high fashion denizens, and commercial clients in the ilk of Victoria's Secret. When IMA met Hammam recently at the castings for Chloé Resort 2015 in New York, the seventeen year old's youthful enthusiasm, natural charm, and playful spirit were impossible to resist. This month Hammam adds photographer Lachlan Bailey to an impressive list of industry heavyweights she has collaborated with this year including Steven Meisel, Terry Richardson, Craig McDean, Karim Sadli, Mikael Jansson, Angelo Pennetta, and Phil Poynter. Bailey captures Hammam's intoxicating exotic beauty for "Opium du Style" in Paris Vogue's August 2014 issue. 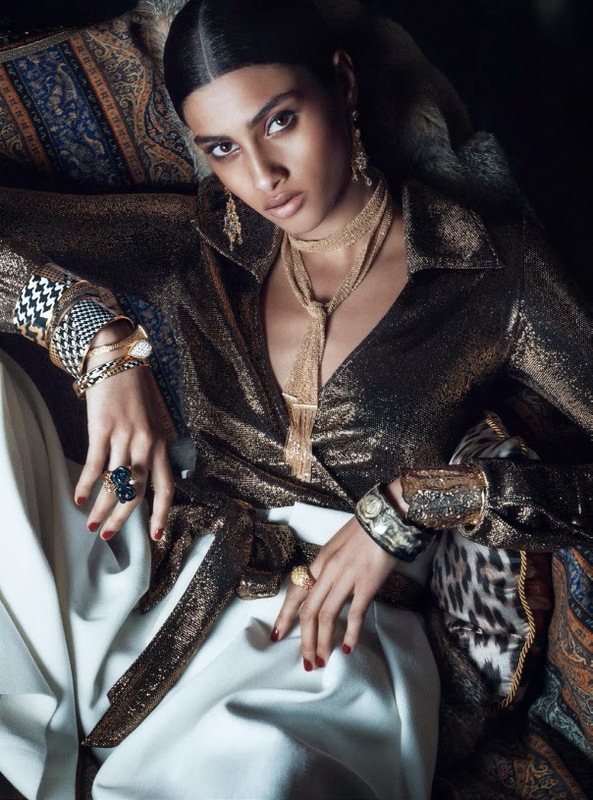 Hammam smoulders while showcasing a treasure trove of opulent bracelets, necklaces, and earrings inspired by the Orient and styled by Géraldine Saglio.